While doing some on-line browsing this holiday season, I stumbled upon Orvis. Orvis is a premiere outdoor apparel and lifestyle retailer. My initial thoughts were, "Fly fishing?! I'm not sure that this site is for me" and "I enjoy the great outdoors, but I wouldn't say that I'm an outdoorsy gal." Despite all of that, I quickly changed my tune after carefully checking out the women's apparel and gift sections. I found some really great gift ideas, like an alpaca sheathed hot water bottle and some monogrammed wine glasses. After saving a few items in my shopping cart for friends, a pair of goat-suede pants caught my eye. I couldn't believe that I'd find something as chic as suede joggers on an outdoors retailer's Website! Needless to say, I snatched them up and afterwards picked out a few other goodies. 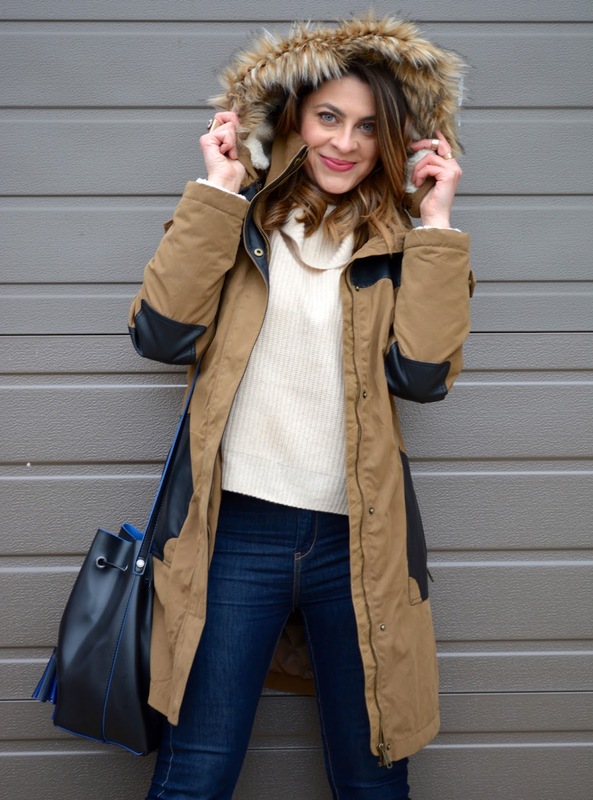 Check out how I styled my Orvis finds. I've got a few different wool coats to get me through the winter, but I've been wanting a parka style coat for a few seasons. This faux fur trimmed down storm coat with vegan leather detailing and shearling panels is perfect to ward off Chiberia chills in cool girl style. Disclaimer: This is an Orvis sponsored post. The blog received product for review, but the comments and opinions are mine. Love the brown colors on you! The first look is my favorite!